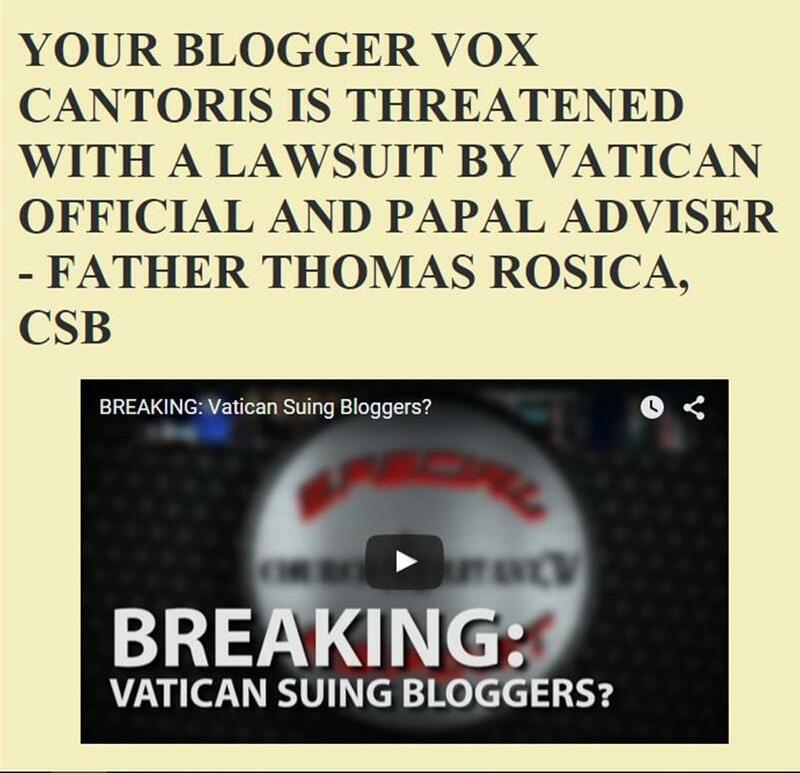 Vox Cantoris: I stand with Father Frank Pavone! I stand with Father Frank Pavone! 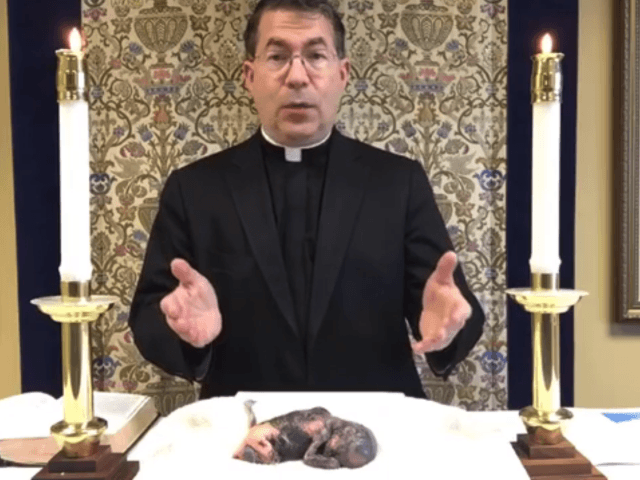 Two nights ago, Father Frank Pavone appeared live on social media at an altar to talk about abortion and the election. On the altar, Father Pavone had placed the dead, saline burned body of an aborted baby - a body intact and of late term. Father Pavone has come under criticism for doing this. Ed Mechmann, director of public policy for the Archdiocese of New York, said the use of an aborted baby 'as a prop' is 'absolutely appalling, and deserves to be repudiated by all of us who consider ourselves to be pro-life in the fullest meaning of that word." Coming from anyone in power in New York, that's rich. Matt C. Abbott at RenewAmerica has Father Pavone's response to this criticism. For what it is worth, this blogger supports Father Frank Pavone and publicly thanks him for his work on behalf of the murdered, butchered children. Placing the baby on the altar evoked, in my mind, the very sacrifice offered there to the Father. The Son was sacrificed on Calvary and re-presented on the Altar. The child was presented to God on that Altar and their soul presented back to him. The baby's suffering, in the great mind of God, was in unity with that of Christ. It was innocent blood spilt for greed and selfishness. It parallels the innocent blood spilt by Christ. For a properly consecrated altar, as below, the candles and flowers are placed on the gradine, not the consecrated altar. Clearly, the supreme lawgiver doesn't care about the GIRM in the nervous disordered Missal and has absolved himself from any law in order to place upon this true altar, the Holy Beachball. While I cannot be certain, that used by Father Pavone, seems to be a private chapel and a table, not a properly consecrated altar. This is not a Mass and it was done to focus attention on the dastardly matter of abortion and the position of one of the candidates for President of the United States. If you're not offended by the pathetic, disgraceful and blasphemous action of what Bergoglio did below after returning from WYD Rio, then you have a problem with your understanding of Catholicism. What does this photo say about this Jesuit's respect for the Altar? These who have risen up against him are comfortable Catholics who want a comfortable faith. They would burn incense to Ba'al if it kept them in their comforts, and they often, do. Perhaps this was an error in judgement on the part of Father Pavone, that is a debatable point. But given his tireless work for the unborn and his faithfulness to his calling, I will not throw him under the bus; something being done by the paid "catholic" bloggers and so-called, journalists out there who will have no problem voting for the devil. God bless Father Pavone and confound those who shy away from the Truth. My American friends, read the post below before you vote. And where is your outrage over these, I can find more! Jorge forgot the bikini, or maybe it is there, out of sight, draped over one of the reliqaries. What a loser, something out of Woodstock. Where are the orthodox waters that can flush out the augean stables of Modernist Rome? And the crashing silence of the bishops continues. I would very much doubt this was a consecrated altar but the action was indeed meant to shock & it has. The nations of the world do need to be shaken out of their reverie. Babies carry the DNA of both parents & are unique beings made in the image & likeness of their Creator both before & after birth. Abortionists & those supporting their murderous actions are worse than beasts who know no better. This has to be the repercussion of the wilful decision at VII to stop evangelising & even catechising their own young & baptised children who then grow into monsters. Fr Michael from your lips to Gods Ears, you will be in my daily rosaries and daily prayers for our dear priests. Fr Pavone is a joy to the Sacred Hearts of Jesus and Mary! VOTE TRUMP! Truth in your face is so impolite! How can you show murder of babies? It causes some delicate souls discomfort. Revolution of tenderness is not for clusters of cells called babies by some fundamentalists. I don't think either of those things are appropriate, but Pope Francis' actions are significantly worse. Fr. Pavone has good intentions that are the result of a well-formed Catholic conscience. I can see where he was going with what he did, even though I think it would have been better to have it in a coffin where a coffin ought to be. The beach ball on the altar, however, was wrong at an entirely different level. One, it was coming from the pope who SHOULD be (but has clearly and repeatedly demonstrated that he isn't) a good example to everyone else on how to offer Mass reverently. Two, it was a cheap toy whose use in the liturgy had no purpose other than to be silly, which I suppose is what I should expect from Pope Francis, whose attitude towards the liturgy seems to be that it is little more than a cheap toy. I wonder, did Ed Mechman get this extremely upset when the videos came out showing all the butchered baby body parts? Or is it his faithfulness to the rubrics of the Holy Sacrifice of the Mass he's objecting to. I also am not sure about the rightness or wrongness of putting an aborted baby on the "altar"?, but honestly, we need to get a little less squeamish in this country. We are at war with EVIL! Does that fact not seep into people's skulls? If Killary wins, they will be seeing much more gruesomeness. Think re-education camps, although I imagine they will try to keep the blood out of the "news". Maybe the Russians will show us what real blood looks like. I don't want war, don't mistake me, but if Killary wins, it will come. Saint Thomas Aquinas teaches us that praying for the soul of the deceased is the greatest act of charity. Thanks Father Pavone. I want to thank Father Pavone. The massacre of babies is hidden away so it won't disquiet the conscience of those who are supporting it by voting for Hillary Clinton! We cannot continue this way, God will not allow us to merrily go our way endorsing the slaughter of innocents. As to whether this was an altar or a private chapel, and whether this was acceptable or not to God, I will leave that to him. I am already sure, that those who would rather not be faced with the results of what they voted for, the killing of a child, would rather not see this. I don't think it is ever appropriate to turn attention away from our Lord on the altar for any reason whatsoever, not even a seemingly noble one. Furthermore, the child should be given a proper Christian burial and not used as a symbol. I am appalled by this, precisely because I am pro-life. Actually, Trump doesn't give a darn and I'm sure he's paid for a bunch of abortions and he feels fine with it. However, even if that's the case and as marginally Republican as he is, he obviously felt or was told by his handlers he couldn't go whole-hog in supporting abortion and would have to at least pretend to be opposed if he wanted the conservative Catholic vote. I don't think he's going to win, so this is probably immaterial, but if he does, I hope Fr. Pavone and all the others who urged conservative Catholics to vote for him as a "flawed candidate" (aka, totally amoral) will try to keep the pressure up. But they'll have no leverage, and probably Trump himself will renounce this position of convenience the day after the election. The butchers of today have far exceeded ,the savagery and barbarity of the pre christian times of human sacrifice,do they think because they perform their butchery in modern clinics they are more civilised than their ancient ancestors.they are worse by far . Fr. Pavone has done more to defend innocent human life than almost any one of us, including the utterly silly Mr. Mechmann. Fr. Pavone has long been disliked by the US Catholic "establishment." This is not the first time they've grabbed onto a controversy and tried to get him hushed and sidelined. One time they were forced to back down by JP2 himself. May Our Sweet Savouir bestow all blessings to Fr. Frank Pavone, for his enduring fight for all aborted babies. I stand with him 100%. I hope the American people see what a diabolical act has been in front of their eyes for oh so long. Please support Fr. Frank Pavone and all Pro- lifers. Fr. Perone had the Holy Spirit as a guide. The Spirit guided him to shine the light of truth on a very dark space. Where better to place a sacrificed baby than on the table of the Lord? A baby baby killed, burned to death. An abortion to be seen by all. Who is the traumatized one? Abortion is a contract killing. The daughters of Dr. Mengala (most abortion Doctors are women) are very rich. They live well. They kill as easy as eating. They are of the same mind set as a member of ISIS. No CONSCiENCE! A vicious barbaric Final Solution for millions of babies with full consent of the law and mother and father. Does any one remember Auswitz?. Fr. Perone. What a man! What a priest! What a human being! Mercy? Fr. Perone is a living treasure of Mercy.